All of the planning for an outdoor event can go out the window if the weather does not cooperate. If Mother Nature decides to bless you, you wake up to a bright, sunny morning with warm temperatures. Yet, even in these ideal circumstances, safety preparations are still needed. While a sunny day does not have the number of dangers associated with inclement weather, certain safety considerations should still be made. If you witness any of the following issues throughout the day, communicate with participants to take preventative measures. Prepare for heat with sheltered locations for participants to cool off if necessary. Always recommend sunscreen and monitoring reapplication times, especially if event attendees are drinking alcohol, sweating, or participating in water sports. Look out for heat injuries - sunburns, heat cramps, heat exhaustion, and heat stroke. If heat injuries occur, keep the patient cool and replenish his or her electrolytes. Sunglasses with ultraviolet (UV) protection can help prevent photokeratitis, which is essentially a sunburn on the eye caused by overexposure to UV rays. Even if the day is cloudy, promoting eye protection is still important. Water, sand, snow, and ice can reflect the sun’s rays. In fact, photokeratitis is often called snow blindness by skiers, who will wear goggles to prevent it. If the day is dry, and there is a lot of movement across soft pack soil or sand, particles will be kicked up. This condition is most likely to occur during races, athletic events, and concerts. Encourage participants to wear sunglasses and even mouth protection - particles can be absorbed into the lungs and create a mud sludge which causes respiratory problems. Participants should drink water when thirsty. For every two bottles of water, electrolyte replacement is important. Electrolytes are minerals that the body loses when you sweat. Since water does not offer electrolyte replacements, sports drinks and electrolyte pills can be given to participants. While dehydration is an issue commonly seen on sunny days, hyponatremia (also known as overhydration) can also arise. A common belief is that water should be consumed constantly on a warm day. However, it is only necessary to drink water when thirsty. Hyponatremia results in a lack of sodium, which can lead to cramping and greater medical issues, and hypokalemia (a lack of potassium), which can cause heart issues and rhabdomyolysis - the disintegration of muscle tissue. While you may wish for the perfect sunny day to never end, sometimes weather conditions can change quickly. Monitor the weather with a program like Weather Tap, which provides the same information that the FAA uses (live Doppler radar, real time conditions, lightning strikes, etc.) Update the head of the event every hour with weather conditions - temperature, wind speed, humidity, and any potential dangers. Enjoy the nice weather but always be alert to issues associated with the sun, dry weather, and heat. Also, remember that the weather can change abruptly so be prepared. No matter the weather, planning an event is a complex logistical challenge. 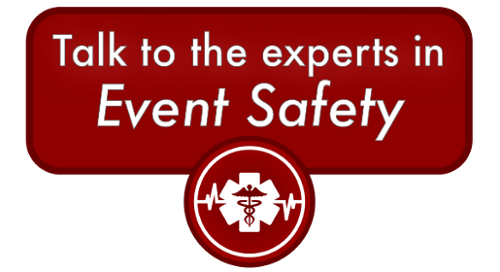 Joffe Emergency Services has the resources, experience, and energy to make it simpler for any type of event.